First impressions- Holy crap... this would be a great place to come for a weekend getaway with my girlfriend. It had "romantic" written all over it... which of course did me absolutely no good at the time. It's an old school cabin. Very clean. Cozy. If you are a coffee drinker bring your own coffee maker... what they supply is standard motel fare where the coffee is in a packet made from a filter. I'm one of those people that grinds their beans fresh every day so take the suggestion with a grain of salt. I improvised by using regular coffee filters and some ground coffee that I had with me. That's about as nit picky as I can get. I found the entire experience there to be wonderful... Very relaxing. It had a very private feel although it was a short walk back to the lodge. I almost tried to stay another day... Please understand... it's not Hampton Inn or Omni nice... it's rustic. The floors are stone. The walls are rock/adobe/brick? Don't know really. But... the cabin is clean and it has an ambiance that is not describable in words. It is a couples retreat imho and I highly recommend it. I'm sorry to say that I only have one image of the cabin and it's an outside view. Not the best either. I'm not sure what the largest sized one is... the one I had was definitely one of the smaller ones as it was along a row - it wasn't a separate cabin by itself. Considered where it is... I would say the accommodations are pretty decent. By the way... the let's try this again start to my post was related to me typing something stupid and then coming back and editing it I just wanted to clarify that because it sounded kind of odd to me when I read it just now. 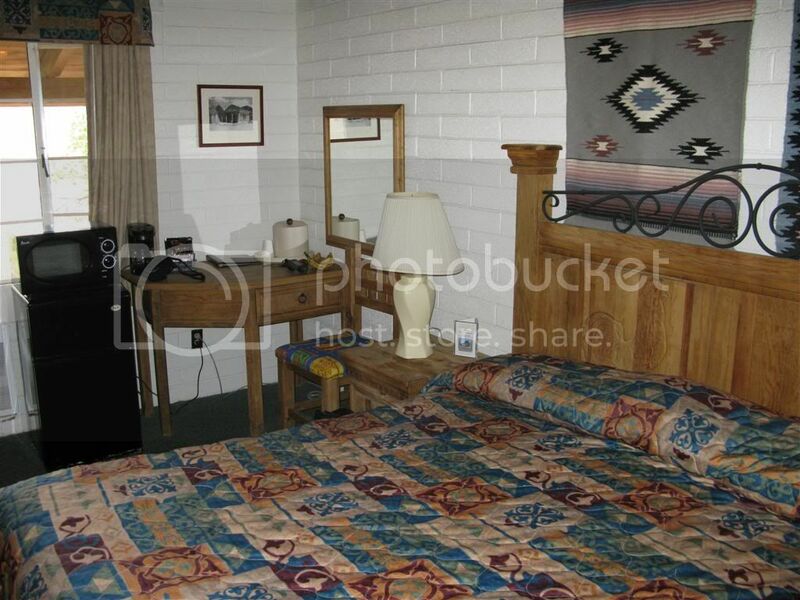 During our first trip to BIBE in 2003, we stayed in one of the Casa Grande rooms. We enjoyed it. The next year, we booked one of the Roosevelt cabins (as noted in the pictures, above) and absolutely enjoyed it. We were there in the summer and they do not have air conditioning, but even in July, you do not need the A/C. It was so cool to hear the wind blowing thru the trees once dark set in. Since that time, we have always stayed in one of those cabins. My wife does not really enjoy camping...but she loves our trips to BIBE when we stay in the cabins. BigBendHiker's wife and my wife are cut from the same mold. She loves being in the Park, but likes that shower at the end of the day. And I like being there with her. Staying in the motel or cabins enables me to get a quicker jump on the day than I would have were I camping. My back definitely appreciates it. I do miss the camping though. Luckily, my wife's willing to do what it takes to make early reservations that gets us cabins sometimes. We were fortunate to get a cabin (#101) over Spring Break. Our friends were in 102. Both those cabins had 2 double beds in the large room and a small side room with an additional double bed. The side room had a curtain that could be drawn. Good for me staying up reading and planning the next days hikes while the kids slept. If I'm not mistaken, the cabin you've pictured, iCe, is the cabin located just south of the motel units, just barely down the road leading to the cabins. The carpeted floor differed from the stone floors in at least 101 and 102. Those cool stone floors felt mighty good on my bare feet after a long day of hiking. They are also remarkably efficient at shattering dropped wine glasses. We've also stayed in the adjoining cabins up the hill, but it was 10+ years ago and I don't recall it too well. I like that 101-103 are stand alone units. Yep. That's the cabin. They called it the VIP cabin. Perhaps because they could up the cost by $30.00. It had stone floors. The main area is a bedroom. Small bathroom to the far right and a small "sitting area" to the near right. That's it. It seemed to me to be perfect for someone wanting to get away to themselves or even better, get away with their wife or girlfriend. That cabin is great for seeing wildlife. Deer and javelina will come up that little ravine and wander right up to the porch in the evening. Just sit quietly and wait. We stayed in #101 last year. It's a nice cabin and quite cool. Yep -- we've stayed in #103 too. Great little cottage! Yep, we've stayed in #103 too, it is simply amazing, the best view by far! The cabins are great, we usually bring a stove and set it up somewhere outside (watching it closely) and just have a great time. Bring your own blender, make margaritas, and watch the sun set! Any pictures posted anywhere of the Stone Cottages 101, 102, and 103? I believe I stayed in 101 once after arriving and founding out that our reservations had been overlooked for 14 men so they scattered us thru out building B and C and one stone cottage. I am more interested in #101 than the rest. I am not responcible for the above post accuracy or validity. With the outside forces of God, Satan, and the small voices in my head, I am not in total control. Therefore read at your own risk and DO NOT CALL 911. Did you see this review with pictures of #102 by atcken?